PEBBLE BEACH, Calif. -- There are markets looking to acquire a NHL team through expansion but there is currently no plan to embark on a formal expansion process, Commissioner Gary Bettman said Tuesday following the conclusion of the NHL Board of Governors meetings. "We're getting lots of expressions of interest, and no decisions have been made to do anything other than listen," Commissioner Bettman said. "We haven't embarked on a formal expansion process, but when people want to talk to us we listen." Commissioner Bettman said the League takes into account three major factors when it receives interest from a market looking for an expansion team. "You want to understand the market and can it support NHL hockey; would it be a good addition to the League?" Commissioner Bettman said. "Two, you've got to have an arena. And three, and perhaps most important, it comes down to ownership. At 10,000 feet, those are the criteria you're dealing with." NHL Deputy Commissioner Bill Daly admitted he has acknowledged that "the Pacific Northwest has strong interest in hockey," but Commissioner Bettman said the League has not ranked the markets that have expressed interest. "There's no ranking. This isn't like a game where we're going to come up with a score at the end of the scrum," Commissioner Bettman said. "The fact is there are lots of expressions of interest from lots of different places and that's great. It's gratifying. It shows the business and the game are healthy because there is so much interest and people want to be a part of the game and invest in the game. That's a good thing." Commissioner Bettman said the NHL will hold an outdoor game, likely a Heritage Classic, in Winnipeg in the next few years, but he stressed no date has been announced and no formal agreement is in place. "We had a discussion with [Jets chairman] Mark Chipman where we said we would like to have an outdoor game in Winnipeg, Heritage Classic, and Mark said, 'That's great,'" Commissioner Bettman said. "We said, 'We're not ready to make any announcements and what is your preference on dates?' He gave us a preference of . There's no formal agreement, announcement or anything else." In 2016, the Jets will be celebrating the five-year anniversary of the return of NHL hockey to Winnipeg. "It's still a work in progress, but at some point in the next few years -- perhaps '16, perhaps not -- we'll have an outdoor game in Winnipeg," Commissioner Bettman said. The NHL will hold its third Heritage Classic on March 2 at BC Place. The Vancouver Canucks will play host to the Ottawa Senators. The first Heritage Classic was played in Edmonton on Nov. 22, 2003. The League held a Heritage Classic in Calgary on Feb. 20, 2011. Daly gave the Board of Governors a detailed report regarding the logistics surrounding the NHL's participation in the 2014 Sochi Olympics. In his remarks Tuesday, he covered travel to and from Russia; specific dates for the Olympic break; insurance; access; and security issues that are detailed in the Olympic agreement between the NHL, the International Ice Hockey Federation, and the National Hockey League Players' Association. "We insisted that our concussion protocol be in effect during the Olympic games and the IIHF accommodated that, so we're going to have strict concussion protocol compliance over there," Daly said. Daly said the NHL had a group of employees in Sochi last week for a test event. "The report back is, while there are still things that have to be finished, it looks like it should all get done on time," Daly said. "It's going to be great hockey, so we're hoping for a good tournament." Commissioner Bettman said the League and NHLPA have to wait until after the Sochi Olympics before determining future Olympic participation. He added that the NHL and NHLPA are in discussions about bringing back the World Cup of Hockey, and that could impact future Olympic participation. 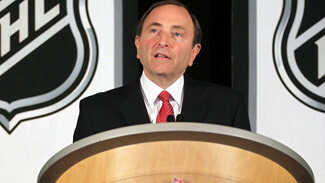 "As it always is, it's a joint decision with the Players' Association," Commissioner Bettman said.